We’ve all been told to examine our cholesterol level regularly and keep it low as high cholesterol is considered to lead to blood vessel diseases, coronary heart disease and even strokes. These conditions are known worldwide as the most likely to cause death at different ages. A high cholesterol level in blood isn’t something that can happen in elderly people only. Anyone may have it: both men and women, the young, the old, the skinny and the plump. Cholesterol seems to have gained a really bad reputation recently. But it has a lot of essential functions in the body: it forms cell membranes and “repairs” weak spots in the body. It is extremely important for baby growth – cholesterol is one of the body’s main components. How can you find out which cholesterol is essential and which one is dangerous? There are two types of it: HDL and LDL cholesterol, and in this article we are going to talk about the difference between the two. Cholesterol basically is a waxy substance resembling fat that is naturally produced by the organism in the liver. Cholesterol is present in most products of animal origin; plants and vegetables don’t produce it. Animals and people need this substance for normal body functioning. It is essential for cell walls (called membranes), i.e. when any new cell is being built, some cholesterol is required. Cholesterol is especially important for such body tissues and organs as the brain, nerve system and muscles. It supports skin, intestines, liver and, of course, the heart. Cholesterol is also required for vitamin D production in the organism and is a key part of production of certain hormones. Cholesterol is an oil-based substance; therefore it can’t mix with water-based blood. 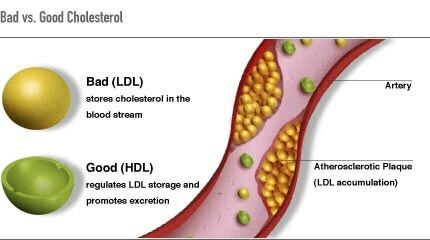 For carrying cholesterol through the blood vessels we need lipoproteins. Blood cholesterol tests show the LDL and HDL cholesterol along with triglyceride level and make up the total blood cholesterol count. Now it’s time to learn more about LDL and HDL cholesterol. LDL cholesterol is also known as “bad cholesterol” because of its ability to form plaque – thick deposits on the vessel walls that impede the blood flow and makes the vessels more rigid, increasing the risk of damage. This condition is also called atherosclerosis and is one of the most common diseases of today’s people of mature age. The most dangerous outcome is when a cholesterol clot blocks the weakened and narrowed artery, as it most likely leads to heart attack or stroke. Another condition caused by LDL cholesterol clots is peripheral artery disease which occurs when the artery leading blood to the legs gets clogged. Unfortunately LDL cholesterol makes up the major part of the body’s cholesterol. HDL cholesterol, on the contrary, is known as “good cholesterol” as it helps to carry LDL cholesterol from the arteries back to the liver, where the latter is broken down and removed from the body. To evaluate the scale of HDL cholesterol effectiveness, it should be mentioned that it carries from 25% to 35% of all blood cholesterol controlling its level along with the risk of heart disease. At this point it would be important to add that triglycerides mentioned above are a type of fat used by the body as an energy storage. It most cases their concentration in blood is normal, but high levels of triglycerides paired with low HDL “good” cholesterol and high LDL “bad” cholesterol significantly increases the dangerous health conditions discussed above. All that, no doubt, means that keeping the cholesterol level healthy means lowering the chance of heart disease and stroke. The American Heart Association recommends checking blood cholesterol every 4-6 years in case you are over 20 years old. You may need to check it even more often in case there are risk factors, such as age, overweight, high blood pressure, smoking or family history. The most danger comes from high LDL cholesterol, while high HDL cholesterol doesn’t mean you have increased risk of diseases. Therefore, when you receive your blood cholesterol test results, pay more attention to its details as the overall “cholesterol” field doesn’t contain enough information about health problems. In any case it is better to discuss it with your physician. Healthy eating and regular physical exercises are considered to be effective ways to control high blood cholesterol levels. Some doctors recommend you strictly control the intake of animal foods, such as egg yolks, meat and cheese, saturated fats and trans fats, along with increasing the consumption of plant-based foods high in fiber. But is that effective? You may give up eating cholesterol-containing foods for the rest of your life and still receive blood test results with high cholesterol levels. How can this happen? We have already mentioned that every single cell of your body can create cholesterol and its excess production occurs when something in the organism goes wrong. High cholesterol can be not only followed by diseases, but it can be a sign of already existing dangerous health conditions caused by improper nutrition and an unhealthy lifestyle in general. Make sure you consult your physician for recommendations in case you notice increased blood cholesterol.